It’s cold and windy outside, but the garden is enlivened by many remaining leaves, fruits, and even flowers in lovely shades of orange and red. Sustainable . . . soybeans? Sustainability is a hard concept to pin down, and usually we don’t associate it with the huge farms in the midwest that grow soybeans and corn to be turned into processed foods. I mean, a monoculture–a corn field, or a bean field, or a lawn, for that matter–is, by definition, not sustainable. So since everyone in the developed world isn’t going to start cultivating little vegetable plots and living off the land, how do we make our food supply more sustainable? It’s a big question, and it’s why a lot of people today buy their vegetables from CSAs or local farm markets and try to avoid processed food. It seems that the CEO of Unilever, a huge industrial producer of food and household products (think Hellman’s mayonnaise, Lipton tea, Maille mustard, several brands of detergent), decided several years ago to make the company sustainable. Today’s NY Times has an article about his efforts and about many of the different aspects that go into sustainability. The title says it all: “Unilever Finds that Shrinking Its Footprint Is a Giant Task.” Among other topics, it touches on energy, packaging, farming practices, law, international agreements. If, like me, you think you understand what “sustainability” means, I encourage you to read the article. You’ll begin to comprehend just how complicated it is to simplify our highly industrialized world. 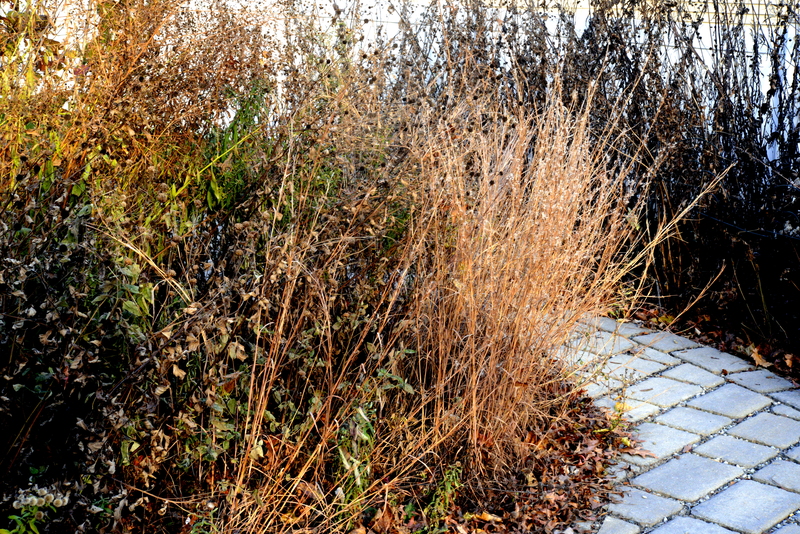 Ready for winter: the fallen leaves mulch the beds, and the seeds from perennials and grasses will feed the birds through the cold months. — Water new plantings: newly installed plants still need watering. Any week in which we receive less than an inch of rain, continue to water all perennials and woody plants installed this season. How do you know when you’ve provided an inch of water? An old yogurt container placed on the ground among the plants makes a great rain gauge. A tunafish or catfood can works equally well. — Tend the fall vegetable garden: if you seeded second crops of cool-season plants like peas, lettuce, and spinach, you’re most likely still harvesting. We have been enjoying a delicious fall crop of arugula, but we could get a killing frost at any time. — Apply an antidessicant spray to broad-leafed evergreens such as rhododendrons and azaleas. These plants are particularly stressed during cold winters. The spray, which forms a very thin plastic coating on the leaves, helps prevent evaporation. You’ll notice that I don’t advise you to clean up your perennial garden in fall. I prefer to wait until spring. Because I plant, and encourage my clients to plant, only native plants that produce seeds and fruits, I leave everything in place for the winter. Even though I don’t hang feeders, my garden welcomes more birds throughout the winter. They eat the seeds on the plants as well as those that fall to the ground; the plants supply cover to the winter foraging flocks as well. And this year’s stalks will be much easier to break down next spring than they are right now. Check out my two latest columns on composting and recycling your leaves on your property. And enjoy the garden this weekend! Coralberry is full of fruit for birds and will retain this lovely color for most of the winter. 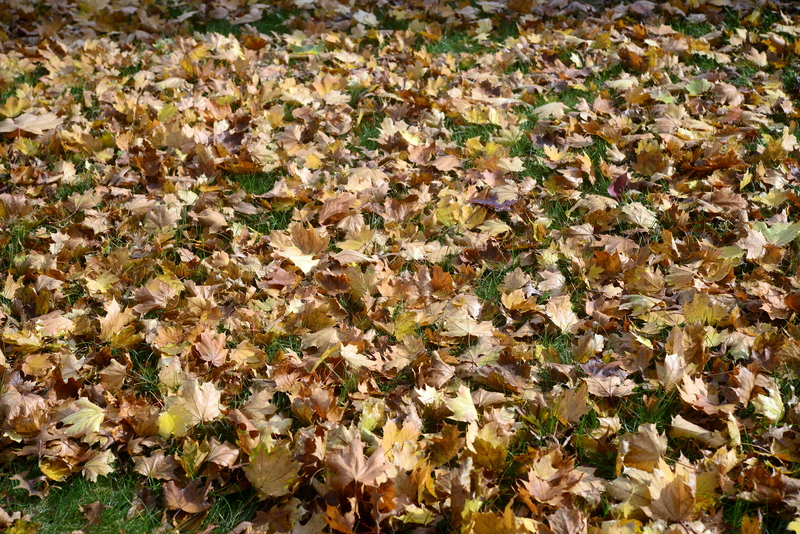 Instead of blowing your fallen leaves out to the curb this year, use them to fertilize your lawn. It’s really, really simple. All you have to do is mow (or order your lawn-care service to mow) without using the leaf-catching attachment. 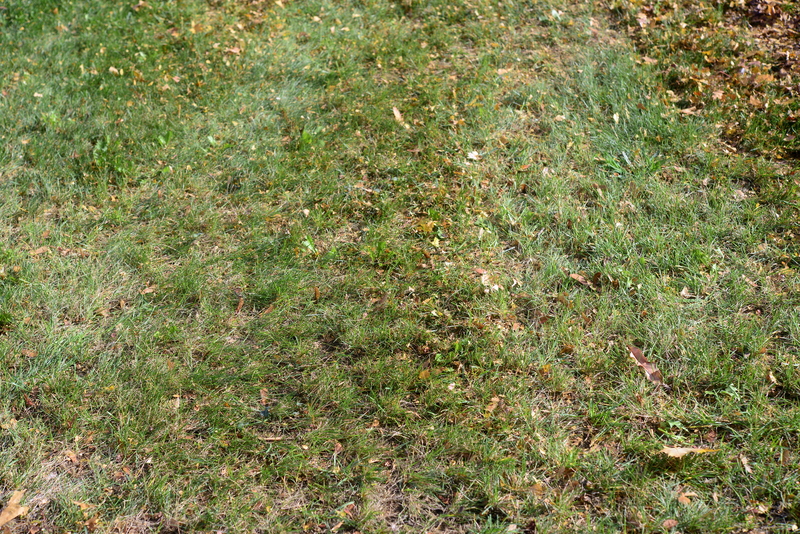 The mower will chop the leaves into very small pieces that will break down quickly, returning nutrients back to the soil. Before mowing . . . These are leaves of Norway maple trees, which are tougher and leatherier than those of many other species, but they respond very well to this treatment. Try it this year. Why throw away the fertility of your soil? The Thain Family Forest in the New York Botanical Garden, the largest old-growth forest in New York city. This weekend is a great time to enjoy the autumn colors. The autumn colors are particularly beautiful right now, so try to get out and enjoy them this weekend. And after the unseasonably warm spell (almost too warm to do all the weeding and raking I’ve done this week), we’re due for cooler, more autumnlike weather. Perfect for walking in the woods. If you don’t have time to go to the NY Botanical Garden or up to Harriman State Park or even to the Ramapo Valley Reservation, take a stroll through the Thielke Arboretum in Glen Rock. The red maples are gorgeous. — Tend the fall vegetable garden: if you seeded second crops of cool-season plants like peas, lettuce, and spinach, keep harvesting. We could get a killing frost at any time. We have been enjoying a delicious fall crop of arugula. You’ll notice that I don’t advise you to clean up your perennial garden in spring. I prefer to wait until fall. Because I plant, and encourage my clients to plant, only native plants that produce seeds and fruits, I leave everything in place for the winter. Even though I don’t hang feeders, my garden welcomes more birds throughout the winter. They eat the seeds on the plants as well as those that fall to the ground; the plants supply cover to the winter foraging flocks as well. And this year’s stalks will be much easier to break down next spring than they are right now. If you leave the season’s growth until next spring, your perennial garden will welcome birds with food and cover all winter long. This picture was taken at the end of November last year.